"You look for trouble and drag everyone else along." 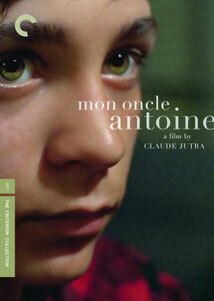 With director/actor/writer Claude Jutra's masterwork, Mon Uncle Antoine, Criterion delivers the crown jewel in the National Film Board of Canada's collection, and a landmark in French-Canadian cinema. Consistently topping the critic's list since its release in 1971 as Canada's best film, Mon Oncle Antoine, tells the coming of age story of a young boy in a small Quebec mining town during the 1940s. Written by Jutra and screenwriter Cl�ment Perron (Taureau) and shot on location in Quebec at the Thetford Mines and Black Lake City, the film chronicles the events of one pivotal Christmas season in this small community. Jos Poulon (Lionel Villeneuve), father of five, is fed up with his job at the asbestos mine under the rule of his Anglophone bosses, and decides to abandon his family to go work in the lumber camp for the winter, leaving his wife (H�l�ne Loiselle) and eldest son to run their small farm and attend to the children. Young Benoit (Jacques Gagnon) lives several miles away in town with his aunt Cecile (Olivette Thibault) and uncle Antoine (Jean Duceppe) at the general store, which is the social center of their community. He helps out at the church as an alter boy, and assisting his uncle, who is also the town undertaker. While Antoine should be the pillar of the community, he instead spends most of his day drinking in the back room, while his nephew Fernand (Jutra) attends to the books and runs the store, with the assistance of Benoit and a young girl, Carmen (Lyne Champagne), who shares both the attentions of Benoit and the unwelcomed leers of Fernand. As Christmas moves ever nearer, the yearly window display at the store becomes the center of attention, although wedding plans and the arrival of a new corset for the town debutante (Monique Mercure) also draw interest, especially from the young boys wishing to sneak a peak at Alexandrine as she tries on her latest acquisition. When the eldest Poulon son falls terminally ill and Benoit's uncle is called upon to go out to their farm, the events that follow will be a revelation as Benoit learns to look at life in a new way, and begins to understand the personalities and relationships of his elders, and his own growing responsibilities in the community. A charming drama, Mon Oncle Antoine perfectly balances its seriousness with a comedic edge, portrayed in a very natural, and very Canadian style. The story, based on co-writer Perron's upbringing in the mining region, counters the foibles of small town life with its realities. Jutra's decision to cast a non actor in the role of Benoit results in a performance that is both powerful and honest, as the young boy observes the complexities of the adults around him. The pacing is slow yet deliberate, allowing the atmosphere of the small town and its inhabitants to simmer as the pieces that form the story's framework present themselves, grounded by cinematographer and long-time collaborator Michel Brault's effectively unpretentious imagery. The elements combine to paint an indelible snapshot of life in this sensitive and touching film. Image Transfer Review: Criterion presents Mon Oncle Antoine in its theatrical aspect ratio of 1.66:1 and in every respect this version is a marked improvement over the previous Image release. The image is essentially free of debris, grain is present though not overbearing and colors are nicely, but not overly, saturated. The look is somewhat soft yet natural, however detail is certainly not an issue. There is the slightest ringing in a few of the later high contrast scenes, but nothing compared to the earlier transfer. Audio Transfer Review: Audio is available in both original French and an optional English dub. The French track is clean with no notable defects. Dialog is clear with no excess sibilance. While no technical problems were observed on the English dub, the performances are not nearly as convincing. Extras Review: While not necessarily impressive in number, the supplements here serve both the film and its creator extremely well. An English theatrical trailer is found on disc one, while the second holds a trio of extras. The 2007 documentary, On Screen: "Mon Oncle Antoine" (47m:20s) explores the history behind and the lasting impact of the film through the eyes of critics, friends, cast and crew members including archival interview footage of Jutra himself. A brief bio/filmography precedes an in depth look at the production, including the social and political elements that are prominent underlying influences within the film. As a close friend of Jutra's, Paule Baillargeon's 2002 documentary, Claude Jutra: An Unfinished Story (1h:22m:14s) takes a broader and more personal look at Jutra's life and career, including the effects of Altzheimer's which ultimately led to Jutra's suicide. Baillargeon attempts to demystify one of the most prominent figures in Canadian cinema, through comments from collaborator Brault, director Bernardo Bertolucci and actors Genevi�ve Bujold and Saul Rubineck. Also included are excerpts from an infamous Jutra/Brault interview with Federico Fellini which they made under false pretense. The final inclusion is an experimental 1957 short codirected by animation legend Norman McLaren in which Jutra deals with an unruly piece of furniture in A Chairy Tale (9m:54s). An essay by film scholar Andr� Loiselle is contained in the included booklet. Mon Oncle Antoine is finally given the Criterion treatment it deserves in this wonderful two disc set. The film itself is given a superb transfer, and the extras serve to honor a man who made a lasting impression on Canadian cinema. Very highly recommended.